Max Verstappen hopes he will be able to mount a title challenge in 2019 with his Honda-powered Red Bull. 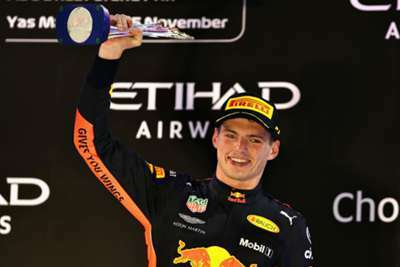 Verstappen enjoyed his best season in Formula One in 2018, amassing 249 points, claiming 11 podiums and finishing fourth in the drivers' standings. The Dutchman shone in the latter stages of the season as he secured five successive top-three finishes, a run that included a stunning win in Mexico before disappointment in Brazil – when a collision with Esteban Ocon cost him victory. Red Bull will switch engine providers - from Renault to Honda - for next season and Verstappen hopes the new alliance can help him go toe-to-toe with champion Lewis Hamilton and Ferrari's Sebastian Vettel. "Hopefully it will be a long-term collaboration," Verstappen told Ziggo Sport. "I don't expect that everything runs smoothly at once, you can't expect that, I think. I will always be focussed, but you also have to believe in the project and be patient. "I do not expect that we can really fight for the championship at the start of the season, but if we are just a little bit better than this year, we can be closer to the competition and run a consistent season, that is already an improvement for the championship. "You do not necessarily need to have the best car." Verstappen will be partnered by Pierre Gasly in 2019 after Daniel Ricciardo opted to switch to Renault.